1.3 16 channel setup: Main board + Daisy module. Following the tutorial on how to get a sleep recording/lab for under $1000 using OpenBCI here a continuation on…. Open Hard- and Software for in-sleep Closed– and Open-loop Targeted and Untargeted Memory Reactivation/Disruption with full-PSG recording. Stay safe, use hardware and software with caution and on your own risk. The (negative) consequences of auditory stimulation protocols during sleep are sufficiently explored yet. The github repository with the source (python) and first binary releases. Only works with OpenBCI Cyton board (from firmware starting at version 2.x.x) and Linux. So you need a Linux distribution for this to work, I would recommend Ubuntu 18.04 LTS because I tested it, it is used by many, it is easy entry …. and you do not have to be a PC nerd to install it properly and safely. Ubuntu is quick to install, see a tutorial to install Ubuntu alongside Windows … or search the web. If you are lazy and do not want to install anything, or just try COsleep, install the USB image on an USB stick and boot from it (UEFI and BIOS). A Debian Live 9.8.0 is on there and pre-configured where you can run COsleep from the folder structure found in the root folder /cosleep. Using the USB stick bootable version will (likely) not alter your PC in any way and it works on most common notebooks/laptops/PCs out of the box. A poster with pictures and infographics, lists’n’stuff shows an example to pack an OpenBCI in a cheap and safe Box. I call it the “Somnofredics Plus PSG”. Its a fun project from a serious collaboration work. For hardware setup I recommend to read the previous tutorial here. A tutorial on the software will maybe follow later. UPDATE: COsleep now allows montages allowing many more setups for your recording. Channels can be either Bipolar (e.g. EMG) or attached to the N pins of the device (then they are referenced to the Reference on the SRB2 pin. Filtering and Re-Referencing to multiple channels for the GUI and the algorithm is also possible. See the montages subfolder with the standard montages as stated below. This makes COsleep a general purpose EEG recording software with OpenBCI. Here are two example setups for COsleep that fit the two standard montages for a 8 channel and a 16 channel setup. For COsleep recording just plug the pins on the OpenBCI device as in the following. two EEG Deviations at C3 and C4 according to the international 10-20 Electrode placement system (that is C3:A2, C4:A1). (optional) further electrodes, mainly in the 16 channel setup and if you have more electrode connectors and electrodes left. The setup records C3, C3, A1 (left mastoid) and A2 (right mastoid) signals separatly referenced to a placed reference electrode at Cz and uses as a bias Bias/Ground electrode at Fpz (placed at the center of the forehead). one of those electrodes can be replaced to an occipital (e.g. O1 or O2) to be more compliant with AASM. Also there is room for additional channels also in the 8 channel setup. The A1 and A1 should not be placed on the ear directly, but on the Mastoids (the “bony”, part behind each ear). More comfortable, better signal properties. This setup is flexible and can deal with one lost mastoid electrode (e.g. in case A2 is lost one can still use C3:A1 as a backup). Importantly, in the setup below (see channels marked with *) all the (non-biploar) channels that are referenced to the SRB2 (N, bottom) pin like the EEG channels like A1, A2, C3, C4. This means those EEG channels are REVERSED in their polarity for their output in the OpenBCI device. An issue often overlooked and ignored by other users! This inversion can only be corrected later on after a converstion (non-“.csv” files like edf, bdf or brainvision files). COsleep will name them as “inverted” channels (e.g. “C3_inverted”). This is unavoidable for a good setup, otherwise one needs to reference against the SRB1 pin (P, TOP), which however will FORCE all channels to be referenced to this channels as far as I understand it, thus not allowing for bipolar channels like EMG and EOG in the same setup. So this setup is clearly preferred. The polaritiy of the bipolar channels are not impaired by this (they are NOT reversed). In total 10 electrodes are used, two channels are still free to be recorded (e.g. occipital of frontal channels, or second EOG etc. ), however would require additional electrode pins that do not come with the kit (but can be bought additionally). 16 channel setup: Main board + Daisy module. 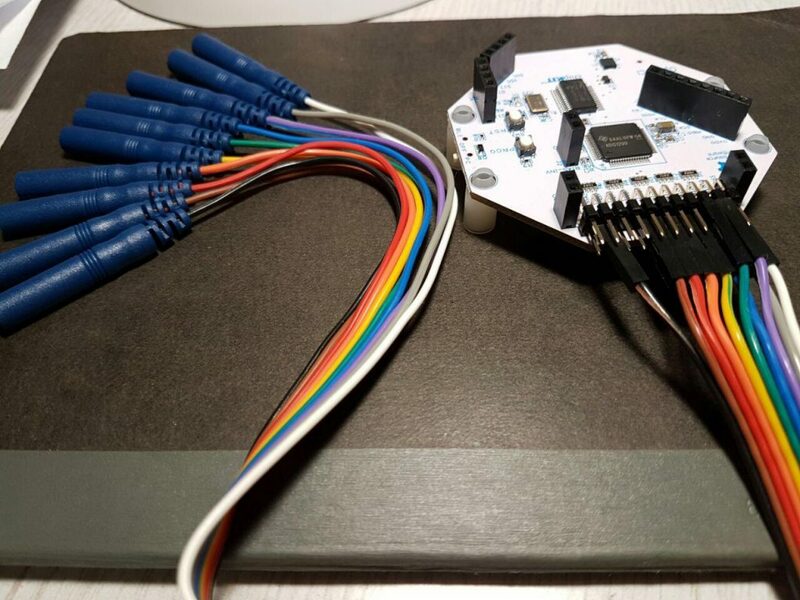 Connect the device’s SRB2 to daisy’s SRB2 and then connect with Reference using a Y cable/bridge (typically provided in the OpenBCI package with the daisy module, but can be build by yourself as well). Choose BIAS pin (for Ground electorde) of either daisy module or device, taking one of any of the two is enough, they do not need to be connected. Additional 10 electrodes (2×10 connectors) are needed. RECOMMEND: You can remove the black and white cable from this connector resulting in 8 additional EEG channels. This avoids confusion them with the Reference (white, connected with a Y cable/bridge) and Ground (black, BIAS) of the first connector the of the setup below. RECOMMEND: You can also use these two extra cables for an ECG (e.g. in the free NP8 channel). P(top) Negative pole, Positive pole Trigger On/OFF Trigger 1000 µV/0µV potential, see below. main N8P 1 N(bottom) ECG, reserved, e.g. noise ECG,Trigger2(EEG) … another bipolar channel. A Trigger / Indicator/ Switch can simply be constructed by the circuit below. Attach it like a bipolar channel on the NP7 pins and use a 5 V USB plug (INTO THE BATTERY, NOT a power supply). It will provide a steady and fast spiking 1000 µV signal when the switch is turned on (neglegtable power draw from the battery) ); the signal is 0 µV when the switch is turned off (no power consumption for that). The trigger voltage on the device pins can be increased or decreased by changing the resistors. One channel is used per trigger. It can indicate Lights-OFF and Lights-ON, or when a standard procedure is performed etc. With a little of standardization one Trigger and a little annotation is usually enough to identifiy all kinds things to be triggered during the recodring (e.g. ON-OFF-ON-OFF sequences every second can indicate changes in procedure, or a short period with switch turned ON, when usually turned off can indicate testing of the signal with eye-movments, blinks, using of jaw muscle etc.). Of course those markers can also be set in COsleep, but hardware triggers are always nicer. Please note, Please built this savely so no 5 V current can reach any of the electrodes or the device. USE THIS ON BATTERY ONLY (for connection to the power supply or amore safe setup you need optocouplers with a safe enough resistance against high currents and voltages). Sound buffer. If you do a Stimulation protocol, make sure to not choose a too short sound buffer. The default is 4096 audio samples at 44.1 kHz corresponding to about 93 ms delay of the sound. Though this delay is considered for the playing of the sounds. For example, at default setting, if a delay of 0.2 s after threshold determination is chosen for closed-loop stimulation, this 0.2 seconds corresponds to 0.107 s + 0.93 s = 0.2 s, where at 0.107 s the conditions for playing the sound are checked The accuracy of timing is the duration of a sample of the signal. The sound buffer can typically reduced to 1024 audio samples (about 23 ms delay), but at lower than this distortions of the sound or cracking noise can be the result. In the log files of the terminal output there are typically “alsa … underun…” messages, that indicate hard- or software could not keep up with accurate presentation of stimuli. With good hardware 256 a delay samples are realistic, but please check if it works. If accuracy of sound is not your issue, but delay is, choose lower delays. Choose the non-default “No anti-aliasing” option in the opening dialog, that makes the signal in the GUI look worse but sufficient. This mainly makes the GUI frontend faster, but can save some CPU power for the backend as well. Choose the non-default “OpenGL”in the opening dialog for view processing in the GUI, that makes use of your hardware better. This mainly makes the GUI frontend faster, but can save some CPU power for the backend as well. When using a 8 channel recording then use the non-default “125 Hz (odd)” instead of the default “250 Hz (all)”, that uses only 125 Hz even though the 250 are available. On the SD card there is always 250 Hz sampling rate stored. 125 Hz is typically enough for standard EEG, EOG and ECG (and sufficient for the vast majority of sleep analyses and beyond), also EMG signals are is typically good enough displayed. You need a lot of good ERP signals grouped together to really start talking about more than 40 Hz signals and their shape. This makes the GUI frontend and the backend faster. Do not use the Extended Signal view for a second window of signals and choose “Only Recording View (fast refresh rate)” but if you must you can make a Montage with only the most necessary channels to view there extra to the Main signal view window, just place a “no” without the quotes in the montage .tsv file in the column called GUI_signalviewer_order. This makes the Main GUI frontend faster, and the backend a little bit too. Disable the default “Highlight spindles” optioin to “OFF”, who needs aid in finding spindles anyway. This makes the GUI frontend faster. Do not write in EDF or BDF. Though this saves very little backend performance, it can be critical on slow hard drives. Consider what you really need for your purpose, are 8 channels with 125 Hz recording enough, and you do not need so much functionality to improve your outcomes in a relevant way…then go for that simple way.